I HAVE SOME really nice gear to play music. But the best thing I have is my Word House. Yup. The Word House. It's a black box shaped like a stage monitor with a light inside. I put my book of words in it. For some reason, I have three or four songs I just can't seem to remember, so I use it as a safety blanket during Cheeseburger gigs. A store customer made it for me - I traded it for a couple of guitar stands, if I remember right. No! Not my Word House! Frank? FRANK! Can you fix it? The Word House has been everywhere and back. Like all of our band equipment, it takes a lot of abuse. It's held up pretty well - I've replaced the light once in three years. Saturday afternoon we were at the Ambiance, setting up for a wedding reception gig, when one of the guys handed me the Word House. I grabbed it by the base, and the whole thing literally came apart in my hands. I was in shock, in tears. No! Not the indestructible Word House! "Two words," said roadie Frank Haxel. "Wood. Glue." "Two words," I said to Frank. "But I can't say them out loud because this is a family-friendly band." 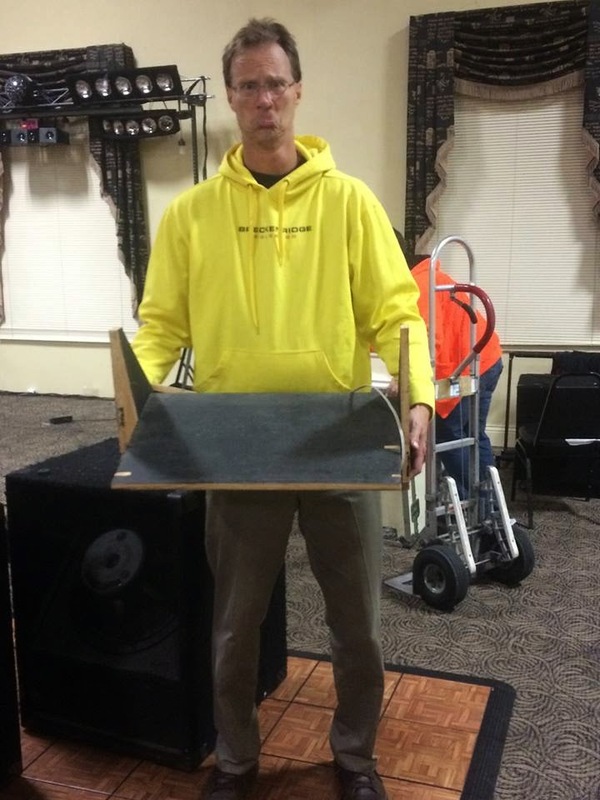 I managed to piece it back together and get it on the stage for our gig, and we survived the night. Until I picked it up again. "I'll fix your dang Word House," Frank said. Sure enough, bright and early this morning, the Word House was waiting in the the back room of Second String Music. It's never looked better. I can still see my words. Life is good. I wonder if we can get Frank to work on our leaky kitchen roof.